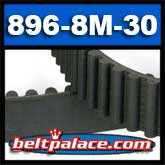 896-8M-30 Synchronous Drive Belt. 896mm Length x 30mm Width. 8mm Pitch. 112 Teeth. Home > Heavy Duty V Belts > Poly-V Ribbed (Micro -V) Belts > J, PJ Section Poly-V (Micro V) Belts - 3/32" Rib Width. > 460J7 Poly-V Belt. 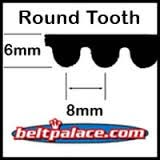 Metric 7-PJ1168 Drive Belt. > 460J6 Belt. Poly-V. 46 inch 6 Rib belt. Replaces Dayton 3X655 belt, Sears C-BT-215 Poly-V. > 896-8M-15 HTD Heavy Duty Timing belt. HTD > 896-8M-30 Synchronous Drive Belt. 896-8M-30 Synchronous Drive Belt. 896mm Length x 30mm Width. 8mm Pitch. 112 Teeth. Round tooth profile. 896-8M/8MGT Industrial power transmission belt used from CNC machines to small engine equipment.